“Often as I read the email, I share with James what event happened that day in history and show him some of the photos or check out the links. As we get into the swing of full time school this fall, I’m looking forward to using it to enhance areas we’re currently studying as well as to add in some fun projects. For just $15 per month, you have the world of learning available to help you lead and inspire your students to explore, learn and and excel! The whole year’s archive can be accessed by subscribers at any time. It’s fun, it’s easy to use and REMINDS me daily that my job is to “INSPIRE” a love of learning. I’m preparing to introduce John Locke to my boys this Friday! I love it! After breakfast, our eleven year old usually says, “Let’s see what’s for today in History!”. I’m usually very careful about sitting down to browse the Internet especially when the kids are around. But This Week in History has gone into our Favorites folder and is visited very often. We learn and have fun with it. The children are genuinely interested in its contents and look forward to researching further the topic for the day online. It’s a fantastic way to bring technology and history to our homeschool. Thank you for that! 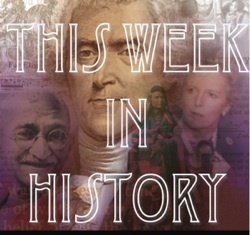 “This Week in History Rocks.” So says my 13yr. old! We are loving all the variety. Instead of studying this and that in one grade and something else in another grade, we just study things all over the place and get really into what interests us. I also have four other children who love it too, and I can cater to them and go deeper with the older ones. It is really inspiring. Thanks for this whole new dimension to our lives! I’ve invited Rachel DeMille’s labor of love and her passion for learning right into my home. I’m never without an idea to inspire, and love the fact that I can quickly access something fun and educational to do with my kids. And: It has more than one application! My husband is beginning to use it in the workplace. He manages a large call center for the phone company. He peruses through This Week in History, and determines what he can use to create themes to motivate his employees. My husband and I have also enjoyed some great discussions sparked by Rachel’s History site. Thank you! 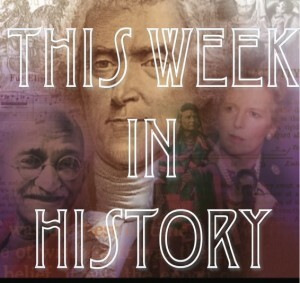 I love This Week in History! I could spend hours on the computer coming up with ideas for kidschool, but instead I quickly read through This Week in History and have wonderful stories and activities to share! I have subscribed to This Week in History for a couple months now and my family loves it! The resources are so helpful and inspiring. My 3 and 6 year old girls have been inspired by Annie Oakley, Christopher Columbus, Louis Armstrong and Anne Frank to name just a few. I think this is an unbelievable value and it is well worth the cost. I would recommend it to anyone who is trying to get inspired by greatness. This truly does put you face to face with greatness and it can’t help but inspire. Thank you Rachel for doing this and all the work you put into it and spreading the leadership education message. It has changed the course of my family and for that I cannot thank you enough. History is such a part of us and it helps us become who we are. It’s such a luxury to be able to have bits and pieces right AT MY FINGERTIPS each week. This Week in History helps our homeschool remember holidays in the way they were meant to be remembered, the real “who’s” and “what’s” of our past as Americans. For a time we did without This Week in History and I found that we usually didn’t take the time to research it on our own; during that time our family missed the devotionals centered around the events and pictures from the past. This Week in History is so “hands-on” and gives our family the edge we need to search out current/past events that teach us so much. My default is to approach homeschooling from a left-brained model. I have used factoids to teach in the most inspiring way I could…but I have not done “subject gymnastics” [Rachel’s term for the way she leaps from one topic/discipline to another, creating abstract and meaningful connections] effectively. Particularly in the areas of math and science; the humanities are easy. This Week in History makes me think of how I can bring principles of human nature and life into math and into science. I now understand much better Oliver’s talk last year at the Forum about right versus left brain or poet vs analyst. He used a Genesis scripture to show poetic interpretation and how it could actually alter the cause of freedom. It was big; I understood it; …but now I own it BECAUSE of This Week in History. I just got started on the site, and I love it already. As a home school mom sometimes it’s hard to come up with ideas for study. I decided to use This Week in History as a spring board for my younger children especially. I took my ten year old and started looking through the week and found the day and week we were on and WOW, he loved it. We navigated through the links for the extra things to use to reinforce the days topic and couldn’t stop. We found links for games, stories, and videos. We especially enjoyed Baseball Math. It is now a Bookmarked page on my computer. We happened to start with the Wright Brothers and planes. We read about them and then found the site for the plane model that the kids can make. We bought the materials together and it is now a “mentor” session activity for my 15 year old son to help my 10 year old son. It is GREAT. The older son is in charge of teaching his brother to follow instructions while allowing him to do his own work at the same time. Just as a side note, this “project” is now in our “closet” and can be pulled out when the “closet” is opened and it keeps them excited to come back and revisit the topic of planes and how to follow instructions on building a model. We’ve really enjoyed This Week in History so far. It’s a simple way to get started on history and keep the kids excited with it’s wide range of choices for activities and such that go along with the day you’re looking at. Thank you!! Can’t wait to get started! *rubbing hands together with delight* Love, love, love and have totally missed the This Day in History. Your teasers have been getting to me for some time now and I can justify the expense; besides–it’s cheaper than most curriculum.